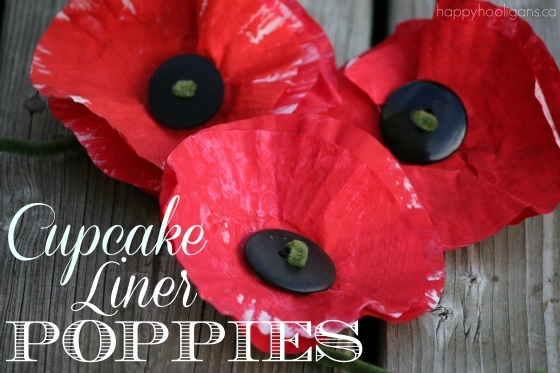 This Painted Cupcake Liner Poppy Craft is an easy craft for toddlers and preschoolers to make for Remembrance Day or Anzac Day. 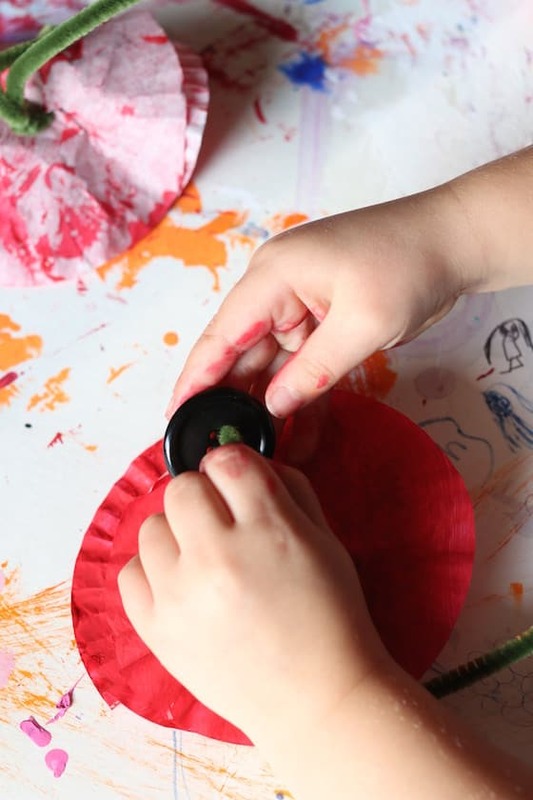 As you’ve likely noticed, the toddlers and preschoolers here in my daycare have been busy making easy poppy crafts for Remembrance Day, which falls on November 11th. 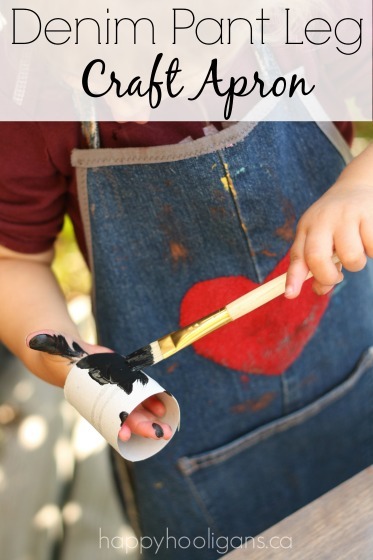 We’ve made quite an assortment of simple poppy crafts using common supplies that you’d find around your home: paper plates, coffee filters, crepe paper etc. 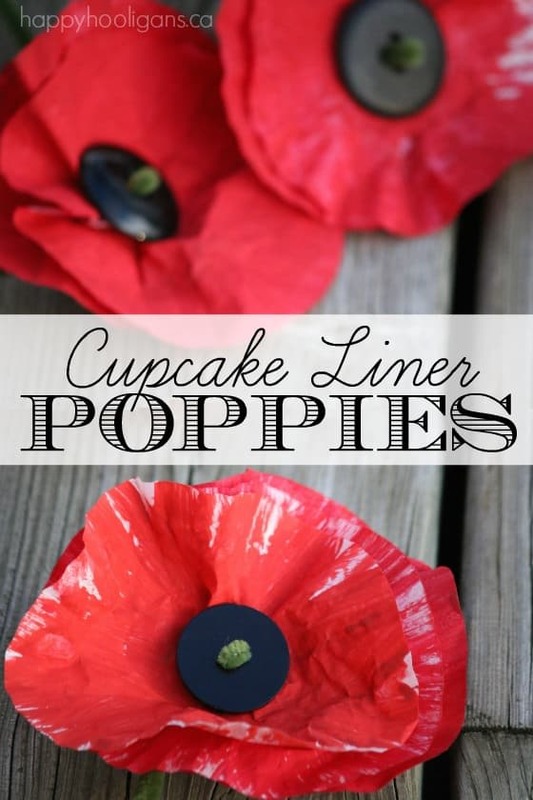 Most recently, we made these painted cupcake liner poppies. 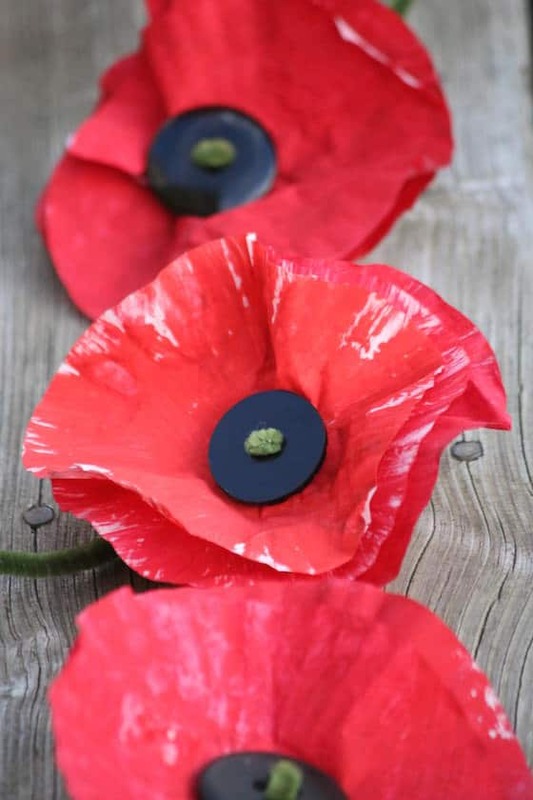 I hope you’ll keep these in mind if you’re looking for a quick and easy Remembrance Day craft to make with the children or students in your home, daycare or preschool classroom. 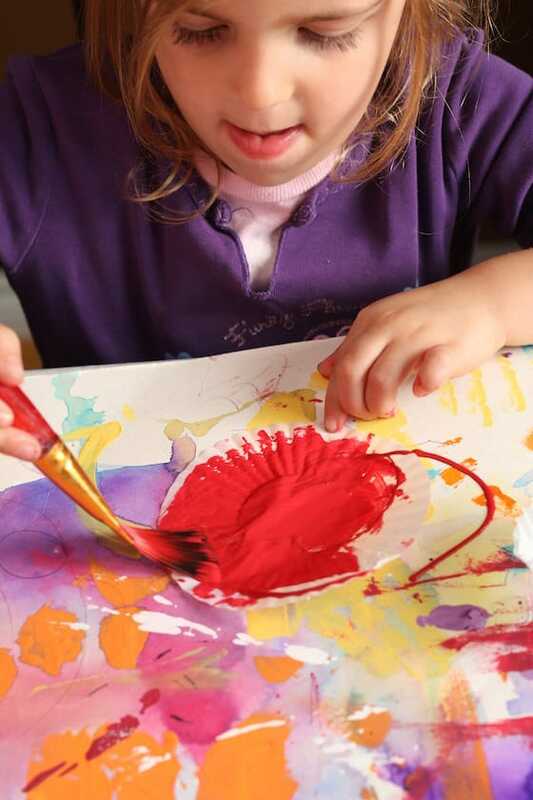 To start, have your child paint their cupcake liners. We did two liners per poppy, and that worked well. We only painted one side of our muffin liners. 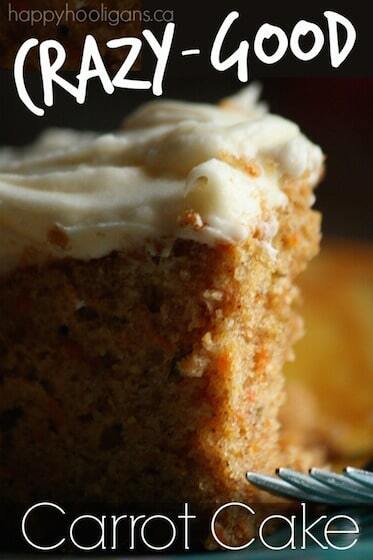 We dried our cupcake liners quickly with a blast from a hair-dryer. 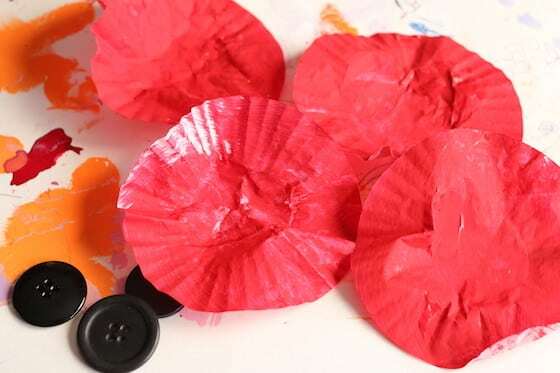 Much like when I dried our painted coffee filter poppies, I held the cupcake liner in the palm of my hand, and blasted the air down into it. That blast of air forced the liners into a cup-shape as they dried. When the liners were dry, we layered 2 together, and chose a button for the centre of the poppy. You’re going to need to poke a couple of holes through the cupcake liners and those holes will need to roughly match up to your button holes. 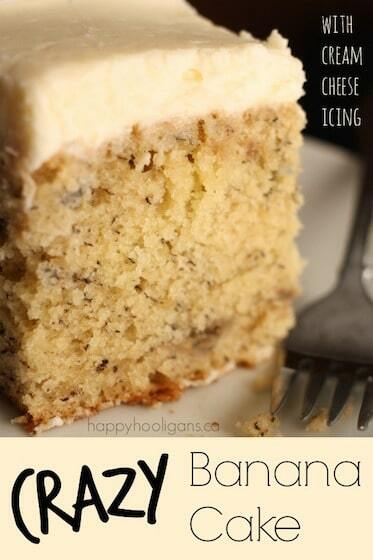 To do this, I just held the two cupcake liners together and poked a pencil through both layers. Then the hooligans threaded a green pipe cleaner up through the cupcake liners. Poke it through the back, and come out through the front. 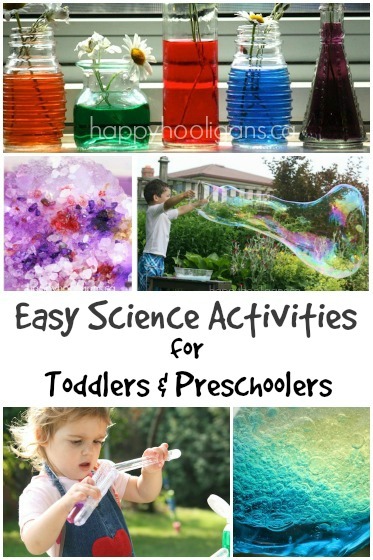 Next, slip a button onto the pipe cleaner. 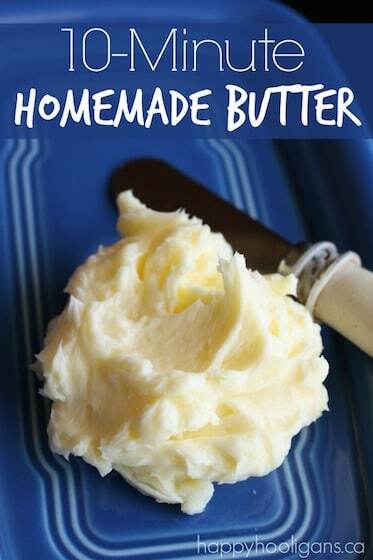 This is a great little fine motor exercise. 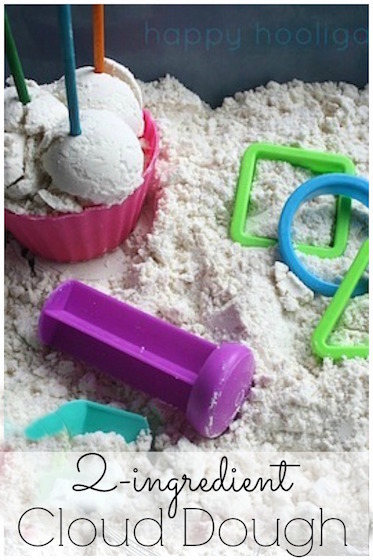 It’s tricky for little ones, but give them a chance to try and do it themselves without jumping in to quickly to assist them. 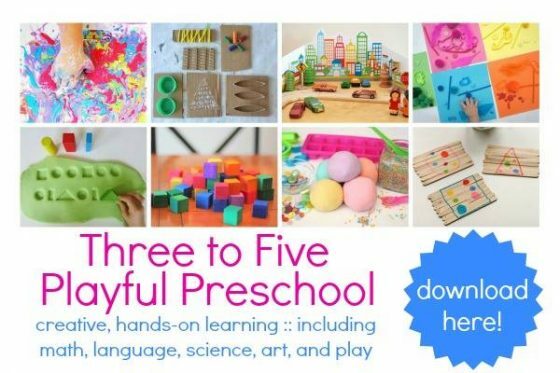 I know it’s difficult to stand back and watch them struggle with a fine motor task like this, but they’ll experience a real sense of accomplishment if they do it without your help. 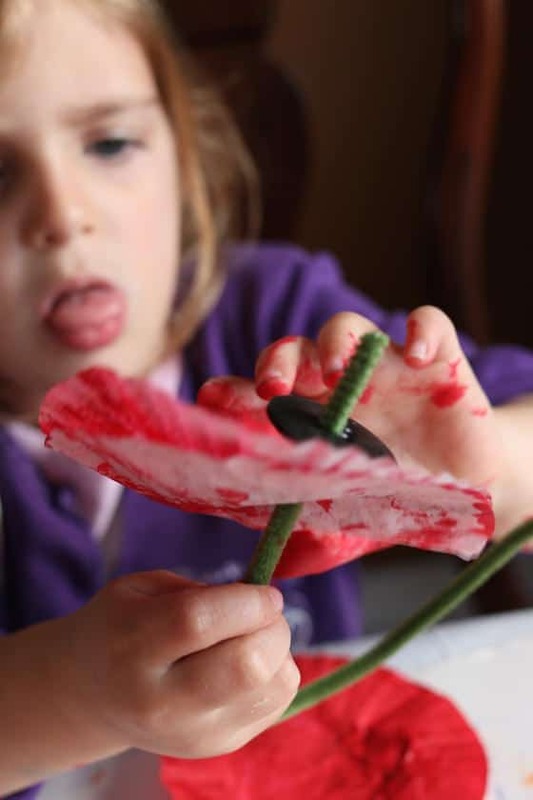 When the button has been threaded onto the pipe cleaner and pushed into place in the centre of the poppy, have them bend the pipe cleaner and thread it back down through the other button hole, and back through the cupcake liners. Finish up by twisting the ends of the pipe cleaner together, fastening everything in place. And now, you have a lovely little poppy for Remembrance Day. Thank you, Lisa! That is music to my ears! I’m so glad you’ve found me!